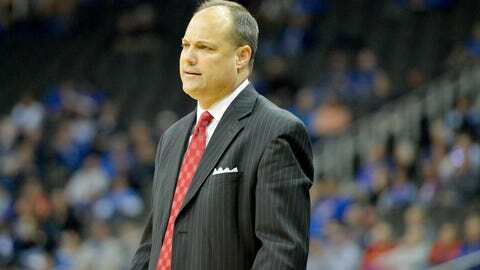 Georgia coach Mark Fox grew up in southwestern Kansas watching and admiring KU hoops. KANSAS CITY, Mo. — A little home goodness the week of Thanksgiving sits well with Mark Fox. The Georgia basketball coach guided the Bulldogs (3-1) into the championship game of the CBE Hall of Fame Classic and will face a tall task Tuesday he actually welcomes. Although the final-round opponent will be No. 5 Kansas (3-1), Fox will get to play an opponent he is familiar with after growing up in the southwest Kansas town of Garden City. He obtained his master's degree at Kansas, where he frequented practices when Roy Williams was coach. Fox also coached at Kansas State as a young assistant. The chance to coach against the Jayhawks was facilitated by an 81-73 semifinal win Monday over George Washington. The Bulldogs recovered from a 36-35 halftime deficit behind 18 points apiece from senior guard J.J. Frazier and junior forward Yante Maten. One key for the Bulldogs came after Fox called for something he knew Williams detested from watching those Kansas practices — a zone defense. Maten leads Georgia in scoring and rebounding with averages of 20.8 and 8.5. Frazier adds an 18.8-point average as the Bulldogs' other scorer averaging in double figures. A chance for Georgia, picked fourth in the SEC, to play Kansas is just another special element about the CBE Classic. On Friday, two of the program's legends, standout forward Dominique Wilkins and coach Hugh Durham, were inducted into the College Basketball Hall of Fame, which is connected to Sprint Center. Kansas toppled UAB 83-63 in Monday's semifinal round after holding the Blazers without a field goal until the midway point of the first half, with the Jayhawks up 23-5. UAB trimmed the margin and trailed by nine at halftime before the Jayhawks started the second half with another lopsided push. Freshman guard Josh Jackson netted 22 points to pace Kansas, the first time this season senior point guard Frank Mason, who added 20, did not lead the Jayhawks in scoring. Several of Jackson's points came off thunderous dunks. “I dunk so hard so nobody challenges me when I go to the basket,” said Jackson, who added that he patterns his drives after Russell Westbrook of the Oklahoma City Thunder. Jackson said one of the qualities he can bring the Jayhawks is “toughness,” and said that could become Kansas' identity. If so, they will need more production underneath. Their two frontcourt starters, senior Landen Lucas and sophomore Carlton Bragg, combined for just seven points against UAB, though they did snag 11 rebounds. A 7-foot freshman backup, Udoka Azubuike, matched Jackson's team high of seven boards. “We've got five good perimeter players, but we've got to find some way to make a basket inside,” Kansas coach Bill Self said. Kansas stands 32-6 all-time at Sprint Center. The Jayhawks could play as many as eight games in the downtown Kansas City arena since the facility will be host to the Big 12 Tournament and the NCAA Tournament's Midwest Regional.